A Cd of 0.157, 1000Nm from a supercharged V12, and 432.7 km/h... on a highway! "Once again, the road ahead contracted into a narrow white band and bridges across the motorway into small black holes. I had to steer with maximum precision at the speed I was driving, but before my brains realized what to do, the car had already raced past." In the Thirties of the last century, motor manufacturers liked to highlight the launch of a new car - and especially a new racing car - with impressive records. In early 1934, for instance, the newly-founded company AutoUnion (one of the forebears of Audi) established the highly prestigious one-hour world record in a first attempt, thereby providing convincing proof of its capabilities. Needless to say, this was also a challenge for their well-established competitor in Stuttgart-Untertürkheim - Mercedes-Benz. 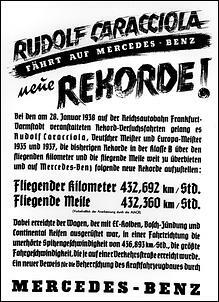 Mercedes-Benz countered at the end of 1934 when Rudolf Caracciola established new records in Gyon, Hungary, and on the AVUS racetrack in Berlin. The duel was on - and fought in the major European 750 kilogram formula races and the autumn record weeks in the following years. The Silver Arrows and their opponents always made for an atmosphere of excitement (see "Legend of the Silver Arrows"). 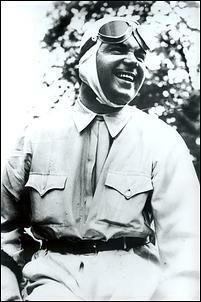 In May 1937, the AVUS racetrack was the venue for the world's fastest "free-formula" race at the time, won by Hermann Lang in a fully streamlined W 125 at an average speed of 261.7 km/h. This streamlined car, powered by a V12 engine rather than the V8 for the 750 kilogram racing formula, was to become the ancestor of the car with which Mercedes-Benz tackled the world speed record in the fall of the same year. However, Europe didn't have speed tracks as well suited as the salt lake near Bonneville in the State of Utah. An alternative was found in sections of the motorways, under construction in Germany at the time. A stretch of 34 kilometres of brand-new, absolutely level motorway between Frankfurt and Darmstadt proved to be perfect for high-speed record attempts. Like the eight-cylinder engine for 750kg formula racing, the Mercedes-Benz DAB V12 engine for the world record attempts originated from Grand Prix racing. Its designers were convinced that it had sufficient potential for the task on hand. With a displacement of 5577cc it wasn't much larger than the eight-cylinder but its output was unmatched by any other engine in the Mercedes-Benz range in the Thirties - a range not exactly lacking high-performance racing power. The final version of 1938 boasted an output of 736hp and an enormous torque of 1000Nm. The aluminium crankcase of the DAB engine was topped by two banks of cylinders in sets of three and arranged at an angle of 60 degrees. It had forged steel cylinders, and the four overhead valves per cylinder in the welded-on cylinder head were equally arranged at an angle of 60 degrees and controlled by four overhead camshafts. Unlike the conventional V-engine design with displaced cylinders, the DAB featured cylinders arranged precisely opposite each other. This had been made possible by special connecting rods - with "normal" big end bearings on the right-hand bank of cylinders and forked big end bearings, extending to the "neighbour" on the crank-shaft, on the left-hand side. The two superchargers, arranged in V-shape at the front end of the engine, were driven by a hollow-shaft extension of the crankshaft. The boost pressure was 1.28 atmospheres - 18.6 psi. 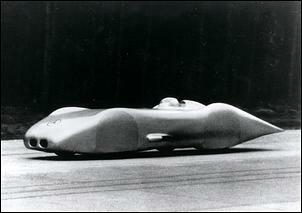 The second crucial ingredient for the record runs was the streamlined bodywork. 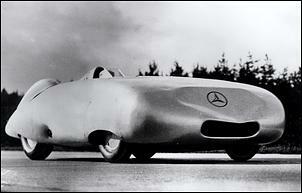 First drafts of a fully streamlined, road-hugging racing car had been made at Daimler-Benz as early as 1935. A first car for record runs emerged from the work-shops in early 1936. This car already had complete underfloor panelling - and its uncompromising lines caused a sensation, not only among experts. It appeared to be simply perfect. The first tests were performed with bodywork that was still unfinished. The speeds attained with the DAB V12, which already developed 616hp, were not entered in any official record. Ongoing development was extremely time-consuming, involving aerodynamic measurements and permanent improvements to the outer skin. The replacement of the rectangular wind-deflecting pane in front of the open cockpit by an arched one, for instance, improved the Cd value by 0.017. Step by step, the engineers single-mindedly moved closer to their aim of breaking the world speed record. In the fall of 1936, Caracciola established, among other things, three class records over five and ten kilometres and ten miles on the motorway near Frankfurt. At an average speed of 333.5 km/h, the ten-mile run marked not only a class record but also a world record. 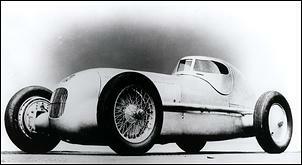 The silhouette and performance of the racing car had again been modified when the AVUS race was staged in May 1937. The front end was more distinctive and lower, the cooling air intake smaller and wheel ventilation better - not least because the race was driven with the full covering of the wheels removed. In addition, the exhaust was now air-cooled in order to reduce the heat in the cockpit. In practice, an aerodynamic weakness revealed itself for the first time when Hermann Lang's car briefly lifted off at the front after driving across a bump in the road at 370 kilometres per hour - too little downforce. The engineers eliminated the problem quickly, by means of modifications to the front end. The bodywork was improved still further for the record attempts in the fall of 1937: it was made longer, narrower and another couple of centimetres lower. At the time, the Cd value was as low as 0.181. And the DAB V12 engine's output had been boosted to as much as 679hp - an additional carburettor had been added to ensure the adequate charging of the combustion chambers in the top engine speed range. In this condition and mirror-polished, the car was carried to Frankfurt for the record week organized by the ONS (the highest-ranking national sports authority in Germany at the time) between October 25 and 31. 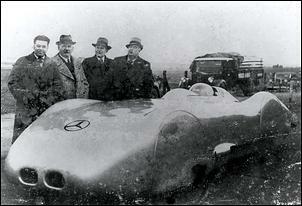 In tests at very high speed, the AVUS problem cropped up again: Caracciola's car lifted off at the front. So the car was sent back to the factory where the nose was modified again - and 90 kilograms of lead were installed at the front. 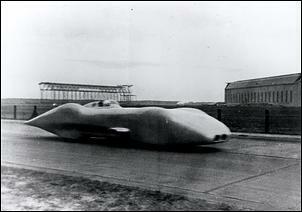 With these modifications, on October 28 Caracciola reached a speed of 397 km/h on one kilometre from a flying start. But AutoUnion had meanwhile attained a speed of 406 km/h, and to make things worse, the DAB engine developed piston and fuel feed problems. The ONS organized a "return match" in January 1938. It was now or never for Mercedes-Benz. The DAB V12 engine was fine-tuned in several respects, including pistons, piston clearance, piston pins, carburettors, intake manifolds and super-charger drive - and as good as new after this treatment. With 736hp, it was the most powerful automotive engine Daimler-Benz had ever built. The bodywork itself - not a scale model as in previous improvement sessions - received its final shape in an aircraft test facility in Berlin. For aerodynamic reasons, the engineers dispensed, among other things, with air cooling - cooling by means of ice was perfectly adequate for the comparatively short record runs. As a result, the initially generously dimensioned cooling air intake gave way to two small air intake openings for the four carburettors. Additional improvements included an even flatter front end between the front wheels, an even longer rear end with an airflow breakaway edge, wheel covers integrated in the bodywork rather than being added on, airflow covers for the exhaust tailpipe openings in the side and a rounded glass cupola in front of the cockpit - all contributing to a sensational Cd value of 0.157, unmatched by any other motor vehicle at the time. Perfectly smooth, polished, powerful and a feast for the eyes, the streamlined Mercedes-Benz was well prepared for another attempt. The car was now 6250mm long and 1850mm wide. It was running on 6.25 x 22 inch tyres at the front and 7.00 x 24 in tyres at the rear. Its dry weight was just 1185kg. The morning of January 28, 1938 was cloudy, but there was no snow. Caracciola was on the scene as early as five in the morning but did not wish to start before the early-morning hoarfrost had thawed and dried. He set out on a first trial run shortly after eight. This was followed by a few last preparations and immediately afterwards by the actual record attempt. "The car hugged the road fantastically - I was gratified to realize this during the trial run already. Its roadholding was quite different from last year's car." That's how Rudolf Caracciola commented the successful attempt when the Mercedes-Benz team sat around the breakfast table one hour later. They had made it together - and had as yet no idea that the speed of 432.7 km/h over one kilometre from a flying start and the 432.0 km/h over one mile from a flying start would remain to this day the highest speeds ever attained on public roads. Today, the record car is on display in the Mercedes-Benz Museum.